HomeBooksI Don’t Remember Signing Up for Cancer! Just days after Sherry was diagnosed with breast cancer she was heart-broken by news reports proclaiming the health risks involved with implants. She cried out to the Lord for a way to be whole again after the amputation of her breast. The very next morning she discovered a little known, innovative reconstruction which uses the patient’s own body tissue to rebuild an absent breast. This procedure, the Free TRAM Flap, involves something that most women over forty have caught themselves fantasizing about at the launching of every swimsuit season… a “tummy tuck!” Sherry decided that if she had to face the horror of losing a breast, gaining a flatter tummy wasn’t a bad consolation. Her book comes from a grateful heart and a longing to give hope to women who haven’t yet heard that reconstruction is alive and well and better than ever before! I Don’t Remember Signing Up for Cancer! 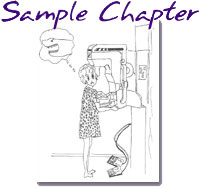 is Sherry’s candid and humorous account of the hills and valleys she traveled in her journey through the experience of breast cancer. 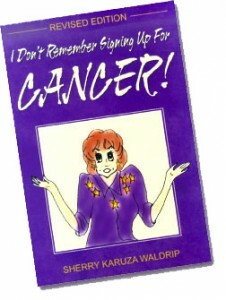 Learn how to purchase I Don’t Remember Signing Up for Cancer!.